Though bread and water sounds like more of a prisoner’s diet than nutrition for endurance, complex carbohydrates and simple fluids are ideal for your marathon best. WHILE THE UK AND AMERICA support the merits of Atkins, the Czech influence on carbohydrates is far healthier and has the perfect foundation for meeting the needs of an endurance runner. Without the chain-reaction that begins with carbohydrates, all running becomes difficult to impossible. Only carbohydrates get stored as muscle glycogen, which we need to beat fatigue during our long runs. Internationally respected nutritionist and advisor of Olympic athletes, Nancy Clark MS, RD, writes often about how to separate fats from carbohydrates for optimum performance. The key, she says, is to “carbo-load, don’t fat-load.” Since many delicious sources of Czech carbs, such as dumplings, kolashes and ice cream are very high in fat, this can be a challenge. The consumption of ice cream is a particular problem: recently The Euromonitor International revealed that in 2003 the Czech consumption of ice cream reached 5.5 liters per head, far exceeding other Eastern European countries. Steve Prefontaine; the 1972 Munich competitor credited for reviving international interest in distance running. Stockier than his competitors, his strength was his will. Complex carbohydrates are a better choice for marathon training and race day. These include fruits, vegetables, pasta, cereals, brown bread, and plain baked potatoes. According to the San Domenico Road Running Club in Cardiff, UK, the 60 kg competitor who runs for two hours daily needs 420 grams of carbohydrates. Gradually increasing these will help give you stamina and keep blood sugar regular. Since symptoms of low blood sugar include headache, blurred vision and irritability, this is important for both our physical and mental health. Balanced blood sugar levels are especially important during our marathon. To keep these levels stable many athletes carbo-load the days before. This becomes progressively important as we approach race day. The night before the race, nervousness depletes our blood sugar levels. As such, we need to eat an especially large amount of carbohydrates the night before. In addition, it’s wise to have a carbohydrate-rich breakfast on marathon morning. However, if you know pre-running dining will upset your stomach, an alternate option is to have a large snack before sleep. Another essential yet often ignored element of marathon training is to fuel up on fluids. Not getting enough water tricks your body into holding onto whatever sparse amounts it gets. This causes bloating. Though flooding our bodies with water makes us feel heavy at first, our body quickly takes over and releases the excess to maintain balance. Clark states: “You can determine if you are getting enough fluids if you are urinating every two hours.” To accomplish this, we need to drink at least 2.5-3 liters of fluid. Orange juice, which has complex carbs and water, is a superior beverage choice. Though it’s tempting, alcohol and caffeine drinks should be reduced during training. Both of these are diuretics, which deplete our water reserves. Our need for fluids and carbohydrates continues through to the finish line. Contrary to myth, what we eat along our route does get digested. This feeds us energy. Small candies work well because they’re convenient – easy to carry and eat – and they become extra important after the first forty minutes, when our glycogen stores drop dramatically. 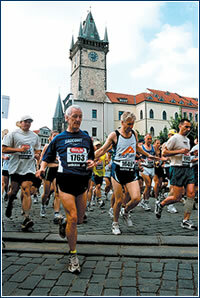 For maximum marathon performance, runners would be wise to increase their carbohydrates gradually. This will prevent stomach troubles. It is also advisable to experiment with different foods and fluids. Doing this will help us determine our best sources of power. After all, we’re all individuals. Knowing and using what makes us strong is the key not only to marathon success, but to victory in the race of life.